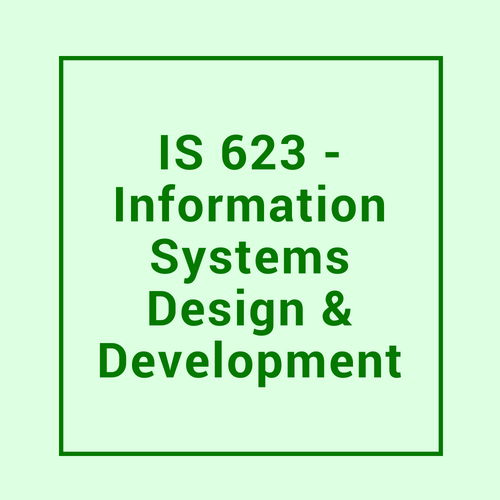 IS 623 – Information Systems Design and Development is a course at Seidenberg School of CSIS which focuses on Business Analysis. This is a Graduate level course included in the curriculum of Information Systems. It is a much needed course for students who are aspiring to become business analysts, as well as students interested in learning about the analysis and design phases of the Software Development Life Cycle (SDLC). The course emphasizes software engineering best practices in creating robust, reliable and appropriate systems. This course instructs students in learning current methods of analyzing businesses and deals with the documentation that a Business Analyst needs to work with. The WHAT part of this course deals with gathering the requirements that are needed for building a system, setting up the system scope (a boundary of the system that says what functionalities will be a part of the system) and the defining goal and objectives for a system. It includes creating a Business Requirement Document (BRD), which lays out the requirements for the system being developed, a scope statement (this sets a boundary to the system), a decomposition diagram (this explains about the system’s functions) and the process flows diagrams (this explains the working flow of the system). All of the above comes together to answer what students will build in a particular system, including what will be included and what will be excluded, as well as what the functionalities will be. The HOW part of the course focuses on methods for developing logical and physical designs of systems. It includes defining the database model, designing the wireframes/prototypes (designs for how the screens of the system will look) and Use cases which show the flow of screens one after the other. Finally, these designs form the bases of systems for the actual development and implementation. In short, this part deals with the question HOW? How will the system be developed? How will the system look and operate? IS 623 also provides students with knowledge of Software Development Life Cycle (SDLC) methodologies such as Waterfall and Agile. Students get to learn different phases of SDLC and how to use it to define a system. Alongside tech knowledge, students get the opportunity to work on crucial soft skills. The course emphasizes necessary communication skills and interview skills a business analyst must have. This course induces into students the idea of thinking like an analyst. IS 623 is available at the New York City campus and is also available Online. If you love to study at home or in a calm surrounding you could register for the online course. Studying in a techy surrounding is fun too. Go ahead with NYC campus if you are a techie! Interested in registering for IS 623? Head on over to your Pace Portal and sign up!